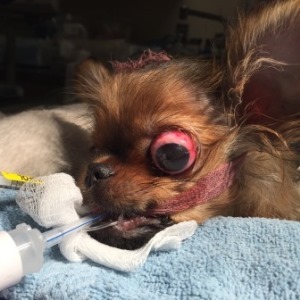 Coby Richter, DVM, DACVS, discusses a case of thoracic trauma in a Yorkshire Terrier after it was attacked by a coyote. Both surgical intervention and critical hospitalization in the ICU were required to treat this patient. An eight-year-old spayed Yorkshire terrier was referred for continued care following an early morning coyote attack. She was ambulatory after being rescued by her owner, but had full-thickness bite wounds over both hemithoraces and a suspected flail chest on the right side. Prior to her arrival at DoveLewis, an emergency clinic placed a chest bandage, administered buprenorphine (0.01 mg/kg) and an ampicillin + sulbactam (50 mg/kg) IV, and started her on Norm R at 9 ml/kg/hr intravenously. She was supported for transport with oxygen via nasal cannula at 2 liters/minute. Upon presentation, the terrier was placed in an oxygen cage, as her pulse oxygenation was 82% on nasal cannula support. Radiographs demonstrated multiple rib fractures, severe subcutaneous emphysema, pneumothorax and lung consolidation consistent with pulmonary contusions. She was normothermic, tachycardic (170 bpm) and tachypnic (44 bpm) with pale and cyanotic mucous membranes. Mean arterial pressure was 122 at admit (179/93). The bandage was intact and covering all wounds, but strikethrough was present on the right side of the thorax. CBC and chemistry were unremarkable with the exception of mild hyperglycemia (145 mg/dl), hypoproteinemia (4.6 g/dl) and elevated lipase (2020 IU/dl). The dog was given oxymorphone (0.1 mg/kg IV) and a 50 ml isotonic fluid bolus over 15 minutes, which was then continued at 2.3 ml/kg/hr. A fentanyl constant rate infusion (CRI) was initiated at 4 μcg/kg/hr. Hetastarch (HES) was started at 0.9 ml/kg/hr for further oncotic support. Antibacterial coverage was extended with enrofloxacin (10 mg/kg IV q 24), and she was continued on ampicillin + sulbactam at 22 mg/kg IV TID. After having a lengthy discussion with her owner, we prepped the dog for an exploratory thoracotomy. During the surgical preparation, a sterile lap sponge moistened with warm sterile saline was held by an assistant over the open chest wounds to improve ventilation by preventing further aspiration of room air into the thorax. Wounds included a 6-cm x 4-cm penetrating (the thorax) wound centered over the right 6th intercostal space (ICS), parallel 3-cm, full-thickness skin lacerations over the 4th and 3rd intercostal spaces, and a small (4-mm) puncture, which communicated with a large (3-cm) defect through the 9th ICS. Soft tissues were severely macerated between these wounds, leaving very little recognizable musculature. Upon entering the chest, none of the right lung lobes were inflated. However, over the following 45 minutes, during debridement of rib fractures and devitalized soft tissues, lavage and repair, a careful combination of manual and mechanical ventilation allowed complete expansion of all right lung lobes. Tooth marks were evident with some bruising (contusions) in the right middle and caudal lobes, however no lacerations were found and no leakage of air or blood was observed during submersion of the lungs in warm saline. A culture was obtained following final lavage. A 16 F argyle thoracostomy tube was placed through the 11th ICS (the first intact ICS encountered), and the right thoracic wall was reconstructed and closed. A ¼-inch Penrose drain was placed due to the severe destruction of soft tissues over the flail chest segment. The terrier was moved to right lateral recumbency and the left hemithorax was prepped for surgery. Two full-thickness skin wounds were present: a 1-cm puncture over the left scapulohumeral joint and a 3-cm laceration over the dorsal rim of the scapula (as well as two small punctures over her abdomen). Exploration of the larger laceration revealed communication with the left hemithorax. A 10-cm, vertical skin incision centered over the 6th ICS demonstrated complete loss of intercostal musculature and periosteum associated with the 5th, 6th and 7th ribs. A complete exploration of the left hemithorax revealed all lung lobes inflating with minimal evidence of contusions and no leakage. After debridement of macerated soft tissues and devitalized rib segments, the thorax was lavaged copiously and communication to the right hemithorax confirmed. Following collection of a culture, another 16 F argyle thoracostomy tube was placed in the left hemithorax via the 12th ICS. The left thoracic wall was reconstructed and musculature (latissimus, scalenus, serratus ventralis m.) was mobilized as possible to close the soft tissue defect. A ¼-inch Penrose drain was used on the left, in similar fashion to the right hemithorax, due to the large separation of skin from underlying soft tissues from the scapula to the 12th rib. A chest bandage was applied following closure, allowing access to both thoracostomy tubes and providing absorptive material for any drainage from the Penrose drains. A nasogastric tube was placed and a triple lumen central line catheter was implanted in the jugular during anesthesia. The dog received fresh, frozen plasma during surgery and in the first four hours post operation. In the first 36 hours following surgery, fluid and air collected from both chest tubes steadily declined, and both tubes were removed at about the 48-hour mark. She received a packed red blood cell transfusion the morning after surgery due to a PCV of 18% and persistent mild tachycardia. Her vitals improved following transfusion, and she began eating (baby food) 18 hours after surgery. She was maintained in an oxygen cage for 36 hours after surgery (oxygen set at 35%). The wounds produced serosanguinous discharge, but the skin remained viable over the large chest wall reconstruction areas. Penrose drains were removed three days after surgery. Lidocaine and fentanyl patches were applied and the dog was discharged 72 hours after initial presentation. She went home on enrofloxacin, ampicillin + sulbactam, meloxicam, tramadol and fentanyl transdermal patches. The culture collected at surgery showed no growth of either anaerobic or aerobic microbes, so antibiotics were discontinued after 10 days. The owner reported at six months that the terrier was doing well with no long-term negative effects beyond palpable irregular bone contour of both right and left thoracic wall. This case is of interest from a few points of view. The dog’s owner is a human thoracic surgeon, and much of the discussion prior to surgery centered on the distinct difference in how small animal thoracic trauma is treated vs. that in humans. Thoracic trauma results from blunt, penetrating or blast injuries. The majority of thoracic injuries seen in people can be managed nonoperatively with the use of thoracostomy tubes and supportive care (such as ventilator therapy). Even in penetrating chest trauma (typically knife or gunshot wounds), only 15-30% of human cases require open thoracostomy. Indications in people (with acute injuries) for open thoracotomy include massive bleeding, massive hemothoraces, and injury to the esophagus, trachea or great vessels. Flail chest, as seen in this patient, is often treated with mechanical ventilatory support rather than open surgical intervention. 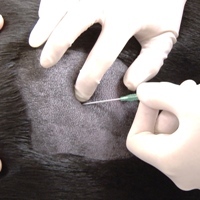 In small animal cases, penetration of the thorax is most often the result of bite wounds (big dog vs. cat or little dog), and is a strong indicator for surgical exploration. 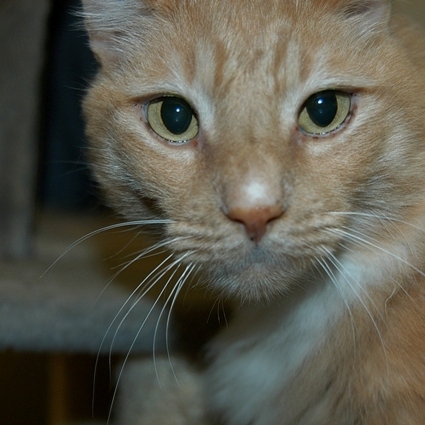 Significant differences in survival of pets and people treated with thoracostomy tubes alone may be related to increase in debris (especially pet hair) carried into the wounds in cats and dogs, as well as contamination with mouth bacteria associated with bite wounds. The shape of the thorax in cats and dogs lends itself to crushing injury of both sides of the chest, even though penetration may only be found through the skin on one side. In this dog’s case, full-thickness wounds were not a good measure of the degree of soft tissue devastation at the intercostal level on her left side. While a median sternotomy would have provided access to both hemithoraces for lavage and inspection of the lungs, it would not have allowed good debridement and reconstruction of the chest walls required bilaterally. Flail chest alone is not absolutely a surgical lesion in small animals. However, the chest segment of this dog’s right thorax was able to be debrided and stabilized at surgery, preserving the limited amount of chest wall in this small dog while preventing further damage from a free-floating section of ribs. The rapid bandaging by the emergency clinic prior to transport to DoveLewis substantially improved her ability to ventilate and prevented further suction of air into the chest prior to surgical intervention. Radlinsky, MG Thoracic Cavity. In: Veterinary Surgery, Small Animal. Tobias and Johnston. Elsevier Saunders, St.Louis MO, USA. Pp 1787-1812. Von Oppel UO et al. Penetrating thoracic injuries; what we have learnt. Thorac Cardiovasc Surg. 2000;48:55-61. Mansour MA et al. Exigent post-injury thoracotomy: analysis of blunt versus penetrating trauma. Surg Gyneol Obstet. 1992;175:97-101. Gopinath N. Thoracic trauma. Indian J Thorac Cardiovasc Surg. 2004:20:144-148. Inci I et al. Penetrating chest injuries: unusually high incidence of high-velocity gunshot wounds in civilian practice. World J Surgery. 1998 May;22(5):438-452. Scheepens ETF et al. Thoracic bite trauma in dogs: a comparison of clinical and radiological parameters with surgical results. Journal of Small Animal Practice (2006) 47, 721-726.